You start off high above a distant planet where you get a chance to acclimatise yourself to the Space Slider universe, adjust your headset lenses and soak up the beautiful world around you before the action starts. 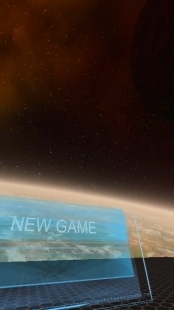 Once you're ready to begin, the menu system allows you to start a new game or continue from where you left off just by looking at the relevant option. Once the action starts you'll find yourself sitting on your space luge. This uses the phone's gyroscope to sense when you lean to the left and right to move your luge! 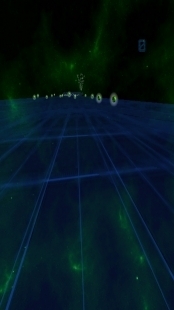 You must collect enough gems and reach the finish line to be beamed to the next quadrant! Complete enough levels and you may just save the universe. 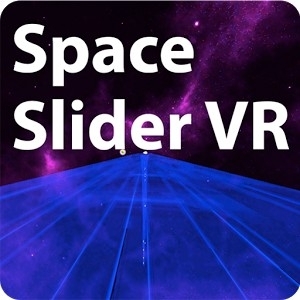 Get "Space Slider VR" now while its free! 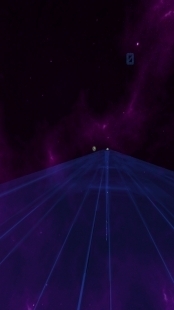 There are many extra levels in development so watch this space for updates. "Space Slider VR" has been designed for use with VR headsets such as Durovis Dive, Lakento, My3d, Google Cardboard, Samsung GEAR, VrAse etc.